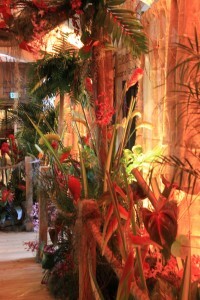 Festive Couture Floral recently visited Westwood Country Club for a jungle themed Bat Mitzvah. The room was transformed by the production team at Exclusive Events. 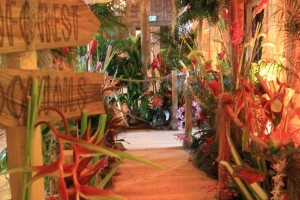 The Exclusive Events team constructed a wood walkway that led guests on a pathway into the jungle. The young lady who the party was thrown for has great passion for sustainability. Those who worked on the project stressed the importance of sourcing materials and products that were eco-friendly and sustainable. Dried bamboo and fresh areca palm leaves were used to bring palm trees to St. Louis in January. The Festive Team searched for the most eco-friendly flowers possible. With temperatures hovering slightly above zero for the past several weeks we were unable to source blooms from any local growers. However, the purchasing team was able to find products domestically from Hawaii. Sourcing flowers from domestic sources ensures fair labor practices and high standards when measuring fungicide and insecticide use. 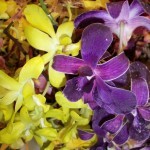 Hawaiian tropical flowers rarely need any fungicide and insecticide because of their ideal growing conditions. Tropical flowers such as the ones listed below are considered a great sustainable option: They also provide warm color palettes when we need them. The Festive team took great care processing and packing the blooms for transport and delivery. Along with Exclusive Events, Festive recreated a jungle along the walkway using the gorgeous tropical floral to create the experience. The moss, roots, flowers and foliage all touched guests through the walkway as they entered the event. Below are a few images from the event that help warm us up during this cold season.